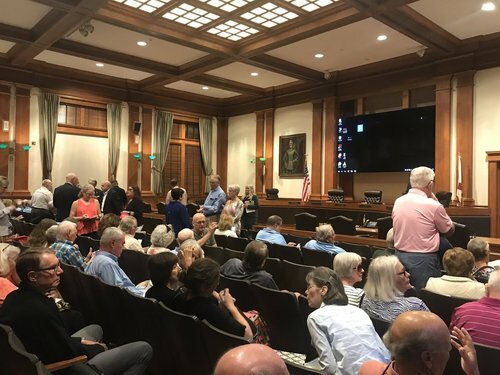 Lee County commissioners are expected to vote on lime rock mine permitting changes Wednesday, April 17, 2019, in the county's growth plan, which could open up new areas to mining. The proposed comprehensive plan changes include eliminating a required analysis of limerock supply and demand and a map that identifies future mining areas east of I-75. I’ve seen elected officials from Estero, Bonita Springs and Sanibel in the audience here this morning. Commissioner Brian Hamman has gone over the rules for public comment. Each speaker gets three minutes. 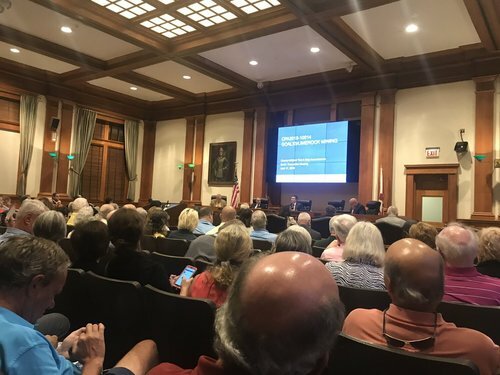 The county manager and county attorney and community development director have addressed the commissioners on the proposed comprehensive plan changes. We're now moving to public comment. The county staff has addressed the steps moving forward after today's meeting. If the commissioners vote to transmit the proposed mining amendments, they would go to the Department of Economic Opportunity and later return to the commission for an adoption hearing. The first three public comments came from Estero Mayor Bill Ribble, Bonita Springs Mayor Peter Simmons and Fort Myers Beach Mayor Anita Cereceda. All three mayors spoke in opposition to the proposed limerock mining changes. Estero Mayor Bill Ribble suggested the county work with FGCU to look at mining in the DRGR. "We want you to take a look at this whole process, and come up with a solution," Ribble said. We've only heard from elected officials so far. They've represented Estero, Bonita Springs, Fort Myers Beach and Sanibel. All have asked Lee County not to transmit the proposed mining amendments to the state. Bonita Springs Mayor Peter Simmons addressed the issue of water quality in his comments: "When you look at the DRGR when you look at what happened with Hurricane Irma, areas in Bonita Springs had standing water for a month. Where does mining fit into that?" Fort Myers Beach Mayor Anita Cereceda: "This county has been known for its conservation principles. Don’t back down on that, gentleman. Mining is not a compatible use for anything." Estero Councilor Jon McLain: "What is our identity for Lee County’s future? Should we be known as the limerock supplier of the entire region no matter what the cost and impact?" We've come back from the break to more public comments. Commissioner Hamman informed the audience another break may happen at 1 p.m. for lunch. Scotty Wood, an Estero resident and chair of the village's planning board: "Listen to the people. Preserve map 14 and preserve our precious water supply. Stop development in DRGR. Do not transmit this badly flawed comp plan amendment..."
A Bonita Springs resident used letters of the alphabet to describe her opposition to the proposed comprehensive plan changes. She ended with "z." "Zilch, the number of people in south Lee County who support these changes," she said. We've started to hear comments in favor of the proposed limerock mining changes from representatives of current mines in east Lee County. Several have told commissioners that limestone is an "essential resource" for the county and the region.